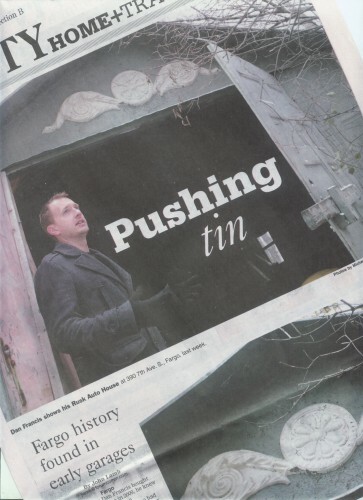 So, I’m just hanging around the house, checking the internet on my phone, and I see a headline from the Fargo Forum: “Pushing Tin: Fargo History Found In Early Garages“. Of course, I know exactly what they’re talking about — one of my favorite things is the Rusk Auto House, a product of the Fargo Cornice and Ornament Co, designed to solve the problem, “the automobile has just been invented, now where do we keep it?” Of course, I was curious to see what sort of interesting info John Lamb of the Forum found for his article, and to my surprise many of the facts come from a source that is, well, ME. A couple places in the article they quote my quirky history website, The Infomercantile, as the source for some of the interesting tidbits about the cost and origins of the little tin house. I even appreciate that he credits me with the price of the Auto-House, when in fact I credit The Forum as the source of the price originally. The most interesting thing to me is, while I thought I’d found most of the Rusk Auto-Houses in Fargo…the one in this article is new to me. It’s nice to be recognized as having useful information to the world, but even more exciting is to find something new I hadn’t seen before. 2 Responses to "Rusk Auto House in the Forum"